We plan to breed Nenana. She is nearly 3 years old. She is the daughter of two of our team dogs, Racer and Lillefot. She is a tough, fast, strong and focused lead dog, relatively masculine built, brown/black, no-nonsense dog. The pictures are of her in action, one of three puppies that we kept, though her blue eyed sister Happy is now lead dog at Svalbard huskies. Brother Juluss is still here, wheel, stong, fast too. Marte has run 300 out of the 400 km. She decided to scratch on the last checkpoint. I am not sure if it was her or the dogs that mostly felt they needed to scratch……at least the decision was not easy to make, because she could have gone on. It would just not be 100% predictable how it would go. The first and second leg went just fine. Very very cold, coats on female dogs, a rest at Tufsing, but the dogs ran fine. They came to Drevsjø as a whole team, no dogs any remarks at all. Rested and ate well. On the way to Søvollen, they passed many other teams, some of which had parked more or less. A very hard and heavy trip for many teams, and nearly where they stopped a little last year, Nenana peed brownish and Marte had her in the sled. Since she is a main leader, so it took a while before the rest of them went back to running, and Marte got frustrated. Keijo came by, as “always” and got them back on the trail. They arrived Søvollen in prettty good condition, but Nenana was taken out by Marte immediately. An hour later she peed yellowish urine and ate well, so maybe she was okay after all….on never really knows. The remaining dogs were tired, but slept and ate well, except Tipp, who did not want to drink. Marte took a good rest. So the decision to treat – in my opinion – was a bit panicky…..he did not SEEM sick. The more likely explanation is that he got some straw in his mouth from eating food in the bed. He had run fine and looked fine, and did not cough once after being taken out, and remained fine. Not ONCE! He ate, drank and seemde just fine. The two who had brownish urine also very quickly rcovered…… . So much for that, but we were down to 5 dogs, and two of the dogs out were not really sick! Bardus, who was also suspect for a cought, was found to be 100 % ok after the rest. Marte got a bit disappointed, but decided to give it a try towards Tynset after the mandatory 8 hour. As she is a somewhat “slow checkpoint chick”, she was not the first one out! The dogs once again ran nice and fast to Tolga. At Tolga we found Racer with a toe injury, she had simply lost the skin on her rear toe. And Juluss had a scratch in the skin from his harness. They were otherwise in good shape. We could have mended the wounds……But Marte once more got a bit down. 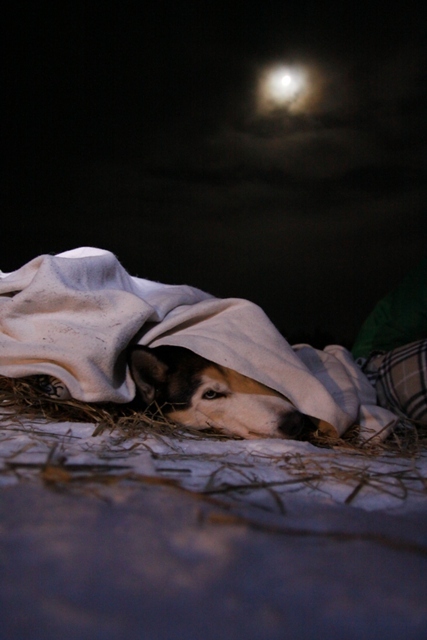 It did not help a lot that one team came in as a returnee from the trail with a snowmobile with very sick and tired dogs, and a cold musher who said it was windy out there…….so eventually, even before resting more, she scratched. Probably not bad, since the dogs are to enter Finnmark as well. In retrospect, Marte regrets scratching, but that was after having slept a while…. Anyway, a good environment for a learning experience for a rookie: extreme cold, hard trails, veterinarian issues and checkpoint work. And being optimistic even when tired! Marte is a very competent musher, so when she is on the trail, she masters it so well!